One of the tell-tale signs of aging is your skin. Collagen and elastin are the two building blocks that your body produces to keep your skin firm and taut. As you get older, your ability to produce collagen and elastin slows down. Without this natural elasticity holding it in place, your skin becomes looser. This can cause a range of negative side effects, like sagging jowls, flabby arms and legs, deep creases over the body, and uneven textures across the cheeks. Loss of skin elasticity can also take its toll in other areas as well, causing unwanted wrinkles in the arms and legs. There is currently a huge market for creams, gels, and lotions that claim to be able to turn back the hands of time, making you appear more youthful than before. However, most of these products simply aren’t enough to provide the transformation that most patients desire. Thankfully, there are a range of cosmetic treatments available that can help erase wrinkles and displaced fat. 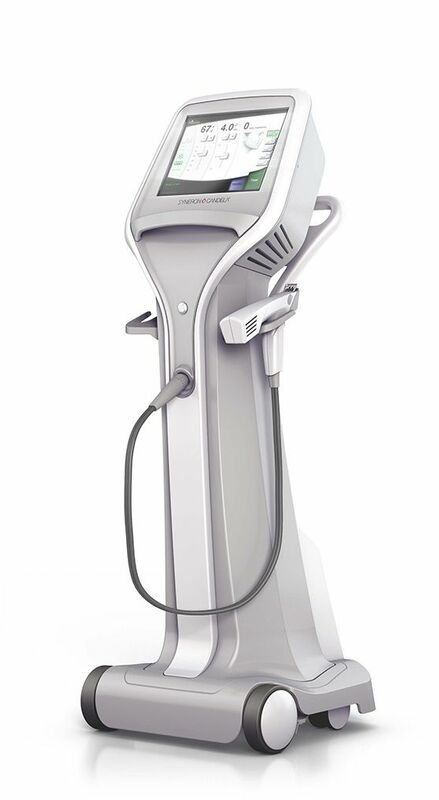 Dr. Elsa Raskin is proud to be able to offer Profound by Syneron Candela, a revolutionary new technology that reduces lines, wrinkles, sagging skin, and even cellulite in the face, arms, and legs. Unlike traditional plastic surgery, Profound is a minimally invasive treatment that can provide profound results with quick recovery. Profound is an state-of-the-art minimally invasive facial rejuvenation treatment that has been created in response to the growing demand for high-end facial treatments that deliver outstanding results with minimal recovery time. Profound is clinically proven to stimulate the growth of the three fundamental elements of the skin - elastin, collagen, and hyaluronic acid. By promoting the natural growth of these elements, the patient will benefit from skin that appears tighter, smoother, and more youthful. Profound is a handheld device that contains microneedles. These microneedles penetrate the skin at both the dermal layer and subcutaneous layer, the inner fat layer. At the dermal layer, the device delivers heat and energy, which triggers a wound-healing response, which then stimulates the production of elastin, collagen, and hyaluronic acid. Despite the use of heat, there is no thermal effect on the skin. At the subcutaneous layer, Profound delivers radiofrequency energy that treats the adipose tissue and restructures the connective tissues, causing the dermal and subcutaneous layer to attach more firmly. The result is better elasticity and volume in the skin, which minimizes wrinkling and sagging, while giving the patient a truly revitalized and more youthful appearance. Profound stimulates the natural growth of collagen and elastin, creating positive results over an extended period of time. As your skin produces more collagen and elastin over the weeks and months following your treatment, you will begin to see your skin appearing tighter and smoother. Most patients find that their optimal result can be seen within three to six months of their treatment. However, only one Profound treatment is needed to stimulate enough growth for a significant improvement. With no fillers or toxins, Profound is a natural cosmetic treatment that can transform your skin, helping you achieve a youthful, vibrant appearance. Not to mention, it is minimally invasive, so you will not need to worry about the inconveniences associated with invasive surgery. To find out more about Profound by Syneron Candela, or to arrange your consultation appointment with Dr. Raskin at her Greenwich, CT office, contact our office today at 203-889-9100.